Birthdays can be tricky to buy for. Particularly as people get older, you might have exhausted all your great ideas. And getting a personalised gift can be even trickier, particularly if you don't want to get a keyring with the name of your loved one on! Therefore why not consider a puzzle gift, particularly if the person you are buying for likes puzzles, of course! We have a range that covers all possible birthdays, so whether the person you're buying a birthday gift for was born on the 5th December or perhaps the 3rd of March, we have a book of puzzles personalised to that exact birthday. 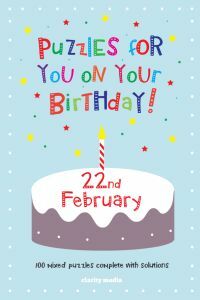 Puzzles For you on your Birthday is packed with a great mix of 100 puzzles including sudoku, battleships, crosswords, wordwheels and many more. 20 of the puzzles are unique and personalised to the birth date, making this a brilliant gift for somebody celebrating their special day! 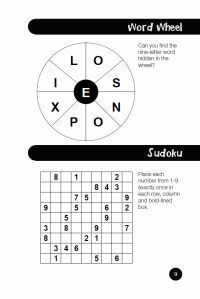 These are themed wordsearch puzzles, where the lucky recipient of the book has to find their birthday in a grid that is scrambled full of the letters and numbers that are pertinent to their birthday. All puzzles are complete with solutions towards the back of the book. Available soon for every day of the year! Click here to find your January Birthday puzzle book! Click here to find your February Birthday puzzle book! Click here to find your March Birthday puzzle book! Click here to find your April Birthday puzzle book! Click here to find your May Birthday puzzle book! Click here to find your June Birthday puzzle book! Click here to find your July Birthday puzzle book! Click here to find your August Birthday puzzle book! Click here to find your September Birthday puzzle book! Click here to find your October Birthday puzzle book! Click here to find your November Birthday puzzle book! Click here to find your December Birthday puzzle book!